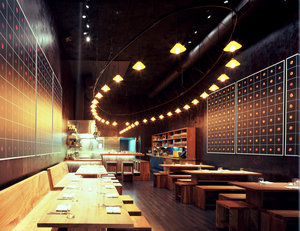 The interior of Plum, now Ume. Photo by Scott Kester. One more item of note: Nick Muncy is the new pastry chef at ~COI~ while Matt Tinder has been promoted to corporate pastry chef (both of them have been with DPG since 2011). Tinder will continue to be involved with Coi, while also overseeing breads and desserts at Plum, Plum Bar, Haven, and the forthcoming Alta CA. Chef Adam Hinojosa—who you may recall was the original consulting chef at ~NOIR~ but did not stay on for the opening of the restaurant in order to continue working at Per Diem and Brickhouse—has now returned to Noir, this time as head chef. He has brought Sarah Shirley (Per Diem’s pastry chef) with him. The pair are cranking out American comfort classics at both dinner and brunch, to go along with the wine selection. At dinner, you can try brisket poutine, chicken and waffles, and lobster empanadas. At brunch, you can try a version of the poutine with pork sausage gravy and egg (goodness, breakfast poutine). Also look for savory and sweet crêpes, a frittata, and egg dishes at brunch. 581 Hayes St. at Laguna, 415-431-6647.